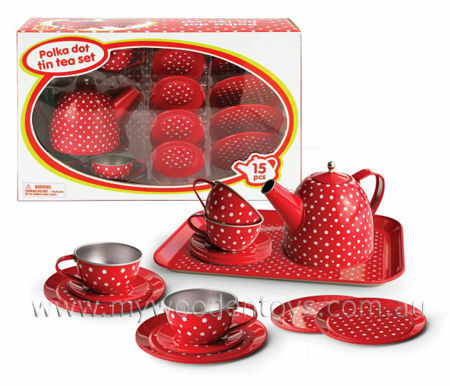 Tin Tea Set Red White Polka Dots is a beautiful pretend tea set with everything you need for a lovely tea party. Beautifully made this tin set has four place settings consisting of cups, saucers and side plates. A lovely teapot with lid and a tray to carry it all on makes it a perfect set. This set comes in a cardboard display box. We like this because: "A classic traditional toy beautifully made."